To be able to automate CUTS on a non-ultimation system does one need to have any cables connected to the "CUTS" IDC connectors right next to each FADER connector on the SL691 Computer? Or are these signals are already on the FADER IDC cables? If yes, where are this connectors located on the console? Can someone share a photo of the panel under the console? 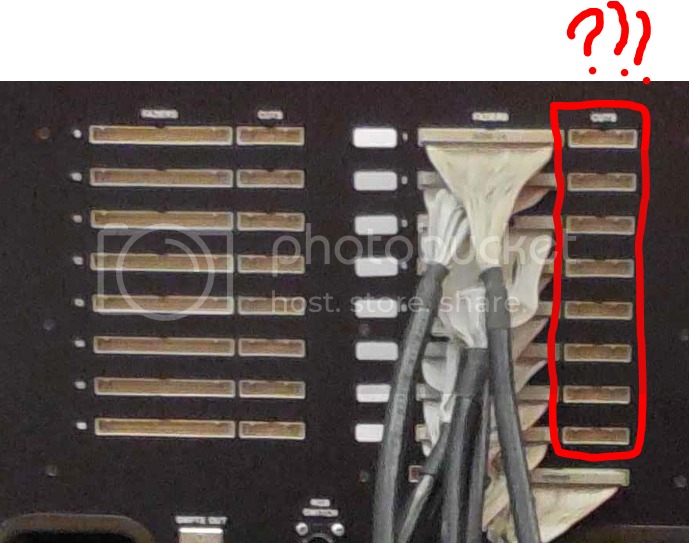 If no, what does the CUTS connectors on the SL691 computer serve for? NO, there is no "CUTS"-ribbon cable going between console and computer!! Sorry for the confusion!! 7.5 and above, is a cut, as you can cascade cut voltage via the VCA groups, making the cut light illuminate without a button press. Thanks for the help. That exact issue appeared on today's conf call. So you're saying that actually the CUTS IDC connectors aren't used and instead the >7.5v reference is used to detect if a CUT button was pressed? So you currently don't have any CUTS cable connectors and you can record CUTS automation? This would actually make sense. On the Ultimation system the CUT is represented by a bit ON in the S14 cable, so it's natural that on these console's there weren't any CUTs cables connected. But that raises a question, if the CUTs are identified through the VCA voltages on non-utlimation systems, what the hell server the CUTS IDC connectors for? By the way, can I ask you to take a picture of the connector panel under the console and post it here please? Marc, please let me know also about your setup. Well but that would ease up our task and minimize space since we don't need to fit an extra IDC connector per bay. No such good news for the 5000 users, that would need a different I/O card. path automation system (fitted to SL4000/SL6000/SL8000 Series consoles). special fader look-up tables because the cuts are treated separately from the faders. Select the correct console number accordingly. The CUTS are for the SL 5000. Also it seems although the SSL Computer seems to deal with the SL 5000 moving faders, these are very different from all the other systems. What would led me to believe they would need a different I/O card to be able to drive them. I will declare this issue CLOSED.